A Castle of Power: packed with 28000mAh of capacity, this portable power bank is able to charge most phones 13 times, 2-3 full charge for iPad/iPad 2/iPad Air/Mini iPad or a laptop. Fashionable, Sturdy, and Durable: featuring brushed aluminum alloy finish, it achieves superb heat dissipation and is well protected against wear and abrasion while exuding glamorous fashion and elegance. Ultra-compatibility: complete with USB and voltage-adjustable DC outputs, USB(5V 2.1A)+DC(12V/4A, 16V/3.5A or 19V/3A), it features universal compatibility with most tablet PCs and virtually all USB-compliant devices on the market. 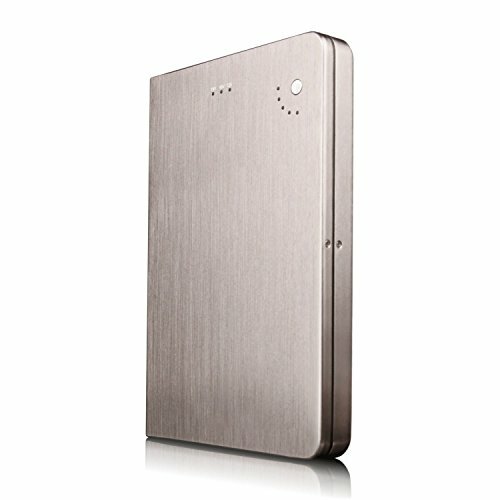 28000mAh of capacity, provides a full charge to most laptops or approximately 13 cycles to most smartphones. Stylish and slim aluminum-body ensures good heat dissipation,the smart digital display window makes it easy to regulate voltage and know how much source you've got left. It will automatically shutdown when short circuit or overload output happen to protect your devices. Package contents: 1 Olympia 28000mAh External Battery Pack, 10 phone connectors, 10 laptop connectors, 1 USB cable, 1 DC power cable, 1 AC 100-240V power adapter, 1 user manual, 1 of each EU/UK/US adapter. 30 Days Satisfaction Guaranteed. 12 Months Replacement Warranty. Please note that some new HP and Dell laptops have a computer chip that tells the laptop not to accept charge from unknown power source. This is to protect the laptop not to be damaged by unfitting adapters. Please check your laptop AC adapter connector diameter and refer to description size chart.